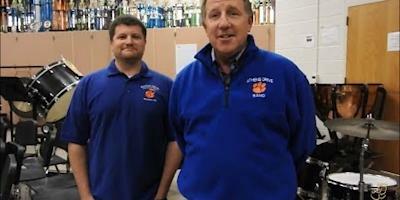 The Athens Drive High School Winter Percussion group is on a mission to raise $10,000 towards the cost of our trip to the April 2019 WGI World Championships in Dayton, Ohio. 1) Performing at the World Championships in Dayton, Ohio is an incredible experience! Percussion students who have had the opportunity to experience the World Championships say it’s an inspiring, energizing, unforgettable, life-changing experience, and truly unlike any other musical event! Not only do the students have the opportunity to perform and compete in front of thousands of people, but they are also able to interact with and watch some of the most talented percussion groups in the world, a truly priceless experience. 2) The Athens Drive Band prides itself on the socioeconomic diversity of its members and is committed to supporting all students in their quest to create music that puts smiles on people’s faces. Despite the smaller ensemble size of the Winter Percussion group - 23 students this season, there are high operating costs, including staffing, music, props, uniforms, and transportation of students and equipment. The $845 per student fair share assessment covers the expenses incurred during the regular season but doesn’t cover any of the cost of the trip to Dayton. All of our Winter Percussion members are also marching band students, who pay a fair share assessment of over $1,200 in the Fall. To participate in both groups, families are spending over $2,000 per student. For this reason, fundraising to help offset the additional expense of the trip to Dayton is crucial for our students. 3) Your tax-deductible donation will help make our students’ dreams come true. Traveling to Dayton with the Winter Percussion ensemble is no small task. The trip costs include transportation of instruments, props, and equipment; hotels and meals for 4 days; and ticket fees of over $200 per student. The Athens Drive Band Boosters is a 501(c)(3) charitable organization, making your donation through this campaign is 100% Tax deductible - Tax ID 65-1227864. Donate before Dec. 31 and write your donation off on your 2018 taxes. Every donation, no matter how big or small, helps us get closer to realizing these hardworking musicians’ dreams. Do you have a business interested in donating? "Drumming up Dollars for Dayton"
The Athens Drive Winter Percussionists GIVE THANKS for your donation, CHERISH the precious opportunity to do what we love – make music, smiles, and memories - and GROW from the life-changing experience of the World Championships in Dayton OH, April 2019, made possible by your generosity!